The 64th Vimal Filmfare awards are taking place currently in Mumbai and our favourite starlets have started arriving at the red carpet. One of those early birds arriving at the event was Janhvi Kapoor was was more than excited to be a part of the Filmare awards for the first time. She also revealed that she's going to be sharing the stage with none other than King Khan! Yep, Janhvi will be performing for the first time at the award show and she's got the opportunity to shake a leg with Shah Rukh Khan. At the red carpet she said that she's pretty darn excited and all that she wants is to go change her red carpet outfit and get on the stage ASAP! Well we totally get her excitement! Who wouldn't be? 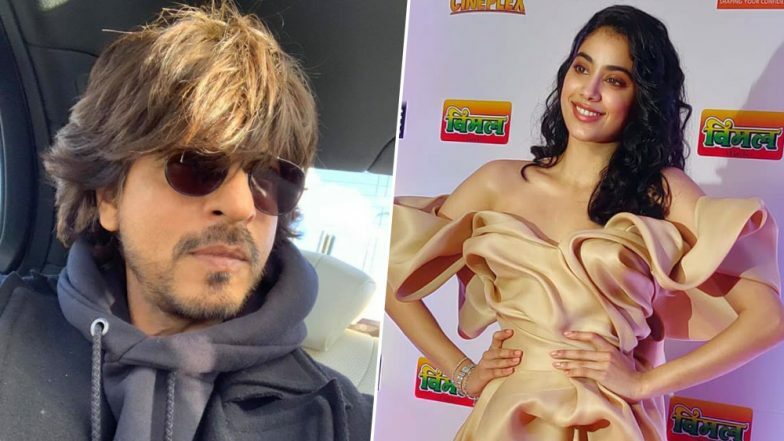 Filmfare Awards 2019: Janhvi Kapoor Rehearses for Performance on Deepika Padukone’s Ghoomae and Nora Fatehi’s Kamariya – Watch Videos. She’s makes a statement at her first ever Filmfare awards. @janhvikapoor has arrived like a diva at the #VimalFilmfareAwards 2019. From what we know SRK will be one of the hosts along with Ranveer. We are super excited to see Janhvi and SRK sharing the stage. How about Ishaan Khatter joining them too? What we also know is that King Khan will be performing with the star of 2019 - Vicky Kaushal. A few glimpses of their performances were released earlier in the day that have only made us eager to see them perform together. Anyway, you guys stay tuned to LatestLY to catch all the live updates about Filmfare 2019.